It’s obvious that The Rock is trying desperately to become the next Arnold Schwarzenegger, going so far as to have Schwarzenegger “pass the baton” to him in The Rundown. But the problem is, thus far, The Rock’s been trapped inside safe, politcally correct movies (ie Scorpion King and The Rundown). Keep in mind that when Schwarzenegger was ascending to the top of the A-list, he appeared in some gleefully violenct and irredeemable films including Commando and (of course) The Terminator. With Walking Tall, The Rock proves that he’s got presence and charisma to spare – but the film suffers from its refusal to step outside the family friendly PG-13 rating. The Rock (aka Dwayne Johnson) stars as Chris Vaughn, a soldier who returns home after a particularly long stint overseas. He wants nothing more than to work in the local sawmill, but quickly discovers it’s been closed for a while. As it turns out, an old buddy of Chris’ - Jay (Neal McDonough) – has gone ahead and opened a casino in the meantime. Said casino has since become the town’s biggest source of revenue – and, as it becomes evident, is contributing to rampant crime and general disarray within his beloved burg. Chris eventually runs for Sheriff and wins, and begins the process of cleaning up – bringing Ray (Johnny Knoxville), an old high school friend, into the fold. Though Walking Tall is essentially entertaining, it never becomes much more than a forgettable time-waster. This is primarily due to the film’s toothless scenes of action, of which there are plenty. It’s unreasonable to expect a movie in this day and age to be as bloody as something like Predator, but there’s got to be some sort of middle ground. As it is, Walking Tall is the kind of movie that young kids could even watch. And, admittedly, there’s no doubt that audiences of a certain age will eat Walking Tall up with a spoon. Having said that, there are number of genuinely engaging performances on display here – starting with The Rock himself. It’s seems clear that Johnson is fully aware of his limitations as an actor, and he does a nice job of keeping strictly within his strengths (it doesn’t hurt that the role doesn’t require much more out of him than to alternate between happy and angry). Knoxville brings some much-needed comic relief to the film, while McDonough is suitably sinister as the villain. There’s no denying that The Rock has what it takes to become a big star. He just needs to start picking and choosing his scripts a little more carefully. Audio: MGM Home Entertainment presents Walking Tall with a Dolby Digital 5.1 soundtrack, and it’s expectedly impressive. It especially comes alive during a sequence in which Chris comes under attack from several men sporting machine guns, with bullets whizzing all around you. Video: The anamorphically enhanced 2.35:1 transfer is just as good, sharp and crisp as one might expect from such a new film. Extras: There are actually a fairly impressive number of bonus features included with this disc, starting with two commentary tracks (one featuring The Rock, and the other director Bray, editor Robert Ivison, and director of photography Glen MacPherson). The Rock’s track is a lot of fun, as he offers up plenty of stories about the making of the film. This is one of those rare tracks that feels as though the speaker is sitting with you, telling you various anecdotes. The second is good, though far more technical. The disc also includes three deleted scenes, an alternate ending, a featurette on the film’s stunts, a short blooper reel, and bonus trailers (along with a short featurette on MGM’s upcoming Species direct-to-video sequel). 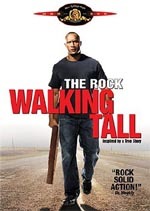 Conclusion: Walking Tall will certainly appeal to viewers who enjoyed The Rock’s work in The Rundown, though it’s hard not to wish the actor would tackle something gritter.